Thanks to Kathy @ I Am A Reader Not A Writer for helping me and my sister Megan @ Reading Away the Days! to host this Charity Giveaway Hop! Below are all the details and a link to where you can sign up all three of us want this to be a very fun and positive hop and are very happy you'd sign up and be apart of it with us! Purpose: To promote a charity that you support.For the post, tell a little about the charity. It can be a local, regional or worldwide charity. Along with the info about the charity host a giveaway. 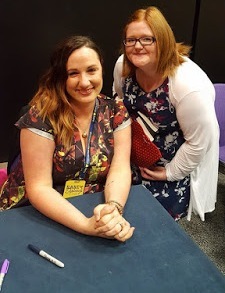 It can be a giveaway related to the charity or it can just be book related! The main thing is to spread the word about your favorite charity! *All family friendly blogs & websites can participate. *Choose a charity to spotlight. *Host a giveaway on your site that runs from March 30th to April 4th. It can be related to the charity or book related. 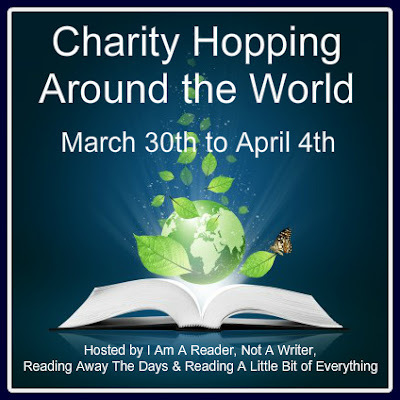 *Include the Charity Hopping Around the World Image & the linky (or link to the hosts sites) in your post. *No restrictions on the number of entries but please keep it simple. *You can include a link to the charity's donation page but donations can not be a requirement or way to enter your giveaway. To sign up simply add your blog to the linky below. Include shipping info in parenthesis after your blog name.